From now on Ucom Universal and Ucom Universal Plus subscribers will receive up to twice more internet on a monthly basis. In particular, the subscribers of Universal 2900 tariff plan will get 3 GB instead of the previous 2 GB, those of Universal 5500 will get 10 GB instead of the previous 5 GB, the Universal 8000 ones will get 20 GB instead of the previous 10 GB, while the subscribers of Universal 12500 tariff plan will get 30 GB instead of the previous 15 GB. «The volume of mobile internet consumption has increased among Ucom subscribers. It’s natural that the tariff plans offered by our company should also be reshuffled in favor of the customers. 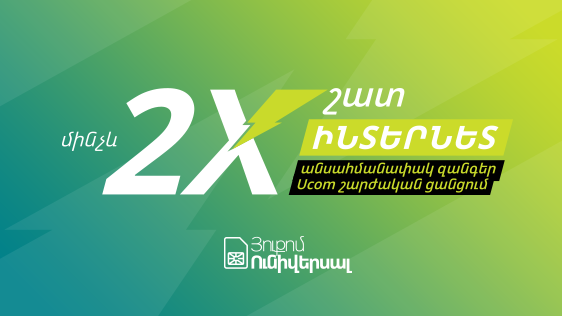 Moreover, we have not only increased the amount of gigabytes we provide, but also enable Universal and Universal Plus subscribers to call unlimitedly within Ucom mobile network upon the consumption of the minutes, included in their tariff», - said Hayk Yesayan, Co-Founder and Director General at Ucom. Let us remind that Ucom’s mobile internet is the fastest in Armenia, while 4G+ network capabilities are among the best ones around the globe as per Ericsson report.